Since its publication in 2005, From Dissertation to Book has helped thousands of young academic authors get their books beyond the thesis committee and into the hands of interested publishers and general readers. Now revised and updated to reflect the evolution of scholarly publishing, this edition includes a new chapter arguing that the future of academic writing is in the hands of young scholars who must create work that meets the broader expectations of readers rather than the narrow requirements of academic committees. At the heart of From Dissertation to Book is the idea that revising the dissertation is fundamentally a process of shifting its focus from the concerns of a narrow audience—a committee or advisors—to those of a broader scholarly audience that wants writing to be both informative and engaging. William Germano offers clear guidance on how to do this, with advice on such topics as rethinking the table of contents, taming runaway footnotes, shaping chapter length, and confronting the limitations of jargon, alongside helpful timetables for light or heavy revision. 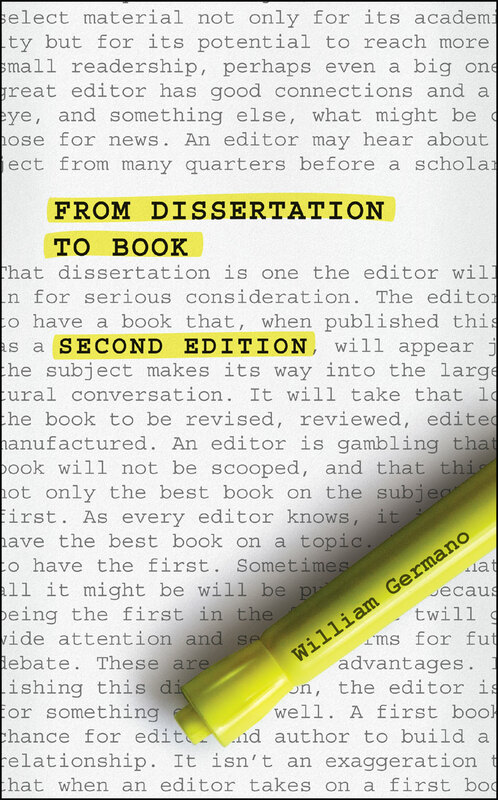 Germano draws on his years of experience in both academia and publishing to show writers how to turn a dissertation into a book that an audience will actually enjoy, whether reading on a page or a screen. Germano also acknowledges that not all dissertations can or even should become books and explores other, often overlooked, options, such as turning them into journal articles or chapters in an edited work. With clear directions, engaging examples, and an eye for the idiosyncrasies of academic writing, From Dissertation to Book reveals to recent PhDs the secrets of careful and thoughtful revision—a skill that will be truly invaluable as they add “author” to their curriculum vitae. "You wrote your thesis, you earned your PhD degree. Now you have to publish your paper to advance your academic career. Although publishing is a must for professors (particularly those seeking tenure), it is not a straightforward process. . . . William Germano’s aim with From Dissertation to Book is to help academics understand why their work might be rejected by publishers and how to make it more attractive to them."